MORE than 120 people took to the streets of Woking on Saturday for a peaceful demonstration about the recent massacre of civilians in Gaza. 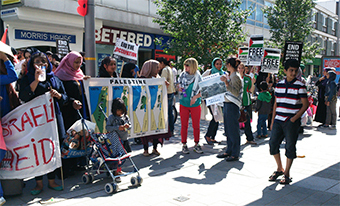 The West Surrey Palestine Solidarity Campaign’s ‘Woking Action for Gaza’ protest followed numerous similar demos across the country over the past four weeks. The static gathering in Commercial Way was to express the solidarity the group have with the Palestinian people, and to raise awareness locally about the plight in Gaza and the West Bank. It is thought that more than 2,000 Palestinians have been killed in the recent conflict, including at least 400 children, while 10,000 people have been injured and entire communities and infrastructure have been levelled. Empassioned by heartbreaking images of the suffering of children and civilians in the small strip of densely populated land bordering Israel, the protesters handed out leaflets to passersby and discussed the situation with them. Supporters believe the Palestinians deserve the same independence, freedom and justice that other nations expect, and they say this can only be achieved by ending the Israeli blockade that has been inplace since 2007. The Palestinian Solidarity Campaign is the oldest British organisation of its kind. It is non-military and uses political means to lobby for peace on behalf of the people. Woking Action for Gaza protesters were making a bid to exert pressure on Israel to respect human rights and international law. The group also encouraged local people to support an embargo on the sale of arms to Israel and a boycott of Israeli goods. Secretary of the West Surrey Palestine Solidarity Campaign, Hilary Stephenson, said: “We were pleased with the turnout of 120 to 130 people, which included entire families. “There was a good atmosphere and many passersby were keen to engage in discussions about the plight of the Palestinians. Some even joined in the demonstration spontaneously, glad to have the opportunity to express their own concerns. “Many agreed with our call for an arms embargo and a boycott of goods as a means of exerting pressure on the Iraeli government to respect international law and the right of the Palestinians to enjoy freedom and justice. As the News & Mail went to press, a 24-hour ceasefire was extended by a day while negotiations continued in the Egyptian capital, Cairo.